On Wednesday night, the Philadelphia Flyers will play their biggest game of the season against the Detroit Red Wings. On Saturday they have the seemingly unbeatable Pittsburgh Penguins and Sunday, the New York Islanders in the last game of the season, which could succeed the Red Wings game as the most important. Sandwiched in the middle of those three games is a contest against the Toronto Maple Leafs on Thursday. While the Flyers, Red Wings and Islanders are fighting for a playoff spot, the Maple Leafs are settling for a bottom-two finish and the management hopes for the top pick at the 2016 draft. It’s easy to see which games Philadelphia – the players and the fans alike – are concerned with. The game on Thursday, especially after the Red Wings, could be forgettable leading up to it. The last thing the Flyers need is for that game to be memorable in a classic “trap” game. A trap game is a contest against a weaker opponent that the “superior” opponent sees as an easy win. It also typically comes with a bigger picture surrounding the team, such as a playoff push. Looking at the Flyers and Maple Leafs records, plus the big picture stories for each team, this game will easily fall into a trap category. This doesn’t bode well for Philly which has had many problems against lesser opponents. The issue isn’t as big as it was last year, where the team was 9-1-4 against playoff teams, yet 0-6-3 against teams looking in during a stretch in March during the 2014-15 season, but things still aren’t perfect this year. Look at the Flyers’ results in March of this year and losses to the Edmonton Oilers, Columbus Blue Jackets and Arizona Coyotes immediately jump off the page. The only other two losses were to the Penguins and the Florida Panthers, both in playoff contention and easier to swallow for Flyers fans. Looking back even further, one of the worst losses for the Flyers this year came in January against the Maple Leafs where Philly was outplayed heavily and couldn’t even gain a point when Matt Hunwick scored with seven seconds left in regulation. But there are issues in the lineup for the Flyers also. Steve Mason will get the start in net against the Red Wings, barring some unforseen problem. Philly has been rightfully riding the netminder with Michal Neuvirth injured, but with six games in nine days, dating back to this past Saturday, the veteran may need a rest. The Flyers have rookie Anthony Stolarz and surprise gun-for-hire Ray Emery waiting in the wings, but Philly may want to lock in a playoff spot for certain before they turn to the second or third option. 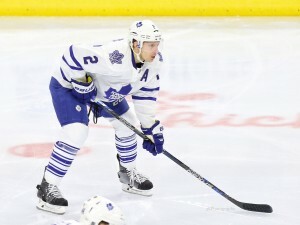 Should the team win against Detroit, a victory against the Maple Leafs may be huge. The Red Wings have the Boston Bruins on Thursday and if the Wings go 0-2 back-to-back, the Flyers will have a chance to go up big with two games or less to play. All of a sudden, the Maple Leafs game could be less of a trap game and more of a playoff-or-bust contest. But whatever position the Flyers are in come Thursday night the team can’t take the Toronto game off or the postseason may not be an option.